OMOR (O.M.O.R.) 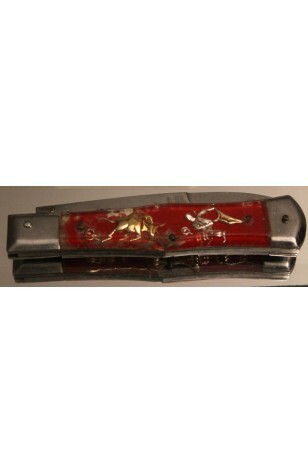 Bullfighter Lucite Handled Pocket Knife - Model #J-260-5, Stainless Steel, from Japan. An Unusual Stainless Steel Pocket Knife from Japan, marked O.M.O.R. - J-260-5. One Side of the Handle Depicts a Bullfighter and His Bull. The Opposite Side has an Oriental Dragon Surrounded by Flowers. The Handle is Red and Blue in Lucite, and the Knife itself is 9" long when open. Blade is 4" Long. A Snap Open & Close, Lock Blade Knife. This is a very attractive Pocket Knife, Showing little Wear for its age and usage.